I saw this picture circulating around the interwebs. * I’ve seen lots of pictures of Jesus walking on the water over the years: pictures of Peter falling into the water, Jesus walking in the storm. I somehow always thought Jesus was barefoot when He walked on the water–as if having shoes on would somehow make Him less buoyant?! Even Jesus had to put His shoes on before he went out into the world each day. * Yes I know it’s slang. ps. How do you like my new Avatar? Mom is taking today off! 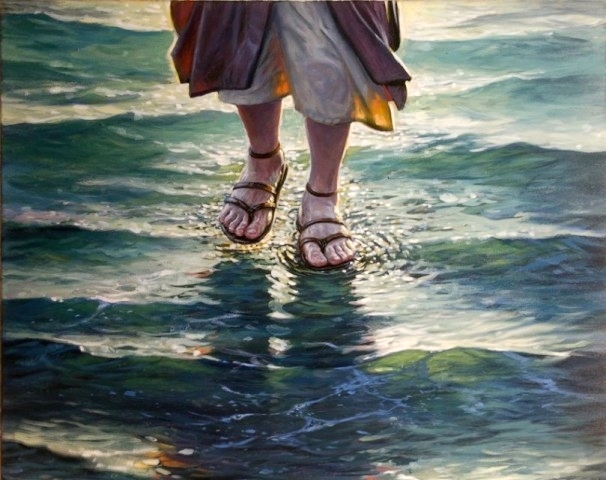 Come to think of it, if Jesus didn’t wear his sandals while walking on water, he would have had to carry them. Good insight, Bongo. And if He was carrying His sandals, how could He catch Peter? He would have to throw the sandals down, or not catch Peter in time! Hi Ellie, I don’t know who painted it, I just found it doing a good search. Thanks for visiting! I love your article,”Jesus wore sandals.”I also love that you put a period at the end of the title.I used to where flip-flops to church,even after thanksgiving,as a way of reminding others and myself to “stay humble,”as one of my favorite musicians,Ms.Sheila E,advises young,up-and coming musicians to do.I would inevitably hear from the self-appointed fashion police about my choice of footwear.They seem to miss the quiet,simple statement I was making (or at least trying to make. )It’s sort of funny because “in spite” of my simple,practical,sensible footwear,I was one of the three best,most formally dressed people at my church on Sunday morning! Thanks Hal. I enjoyed your comment. The stuffier church folk like to dress up, I guess in their minds as a sign of respect. But Jesus came to the poor and sick, and they seldom have fancy footwear. Thanks for visiting my blog! which type of sandal did Jesus wore and what happen to it.